Wearing what appears to be a tan rain coat or over coat, my grandfather Chuck Lowry looks to be quite happy in this photo. Based on similar photos in this series, this was taken when he was still in high school, around 1941. 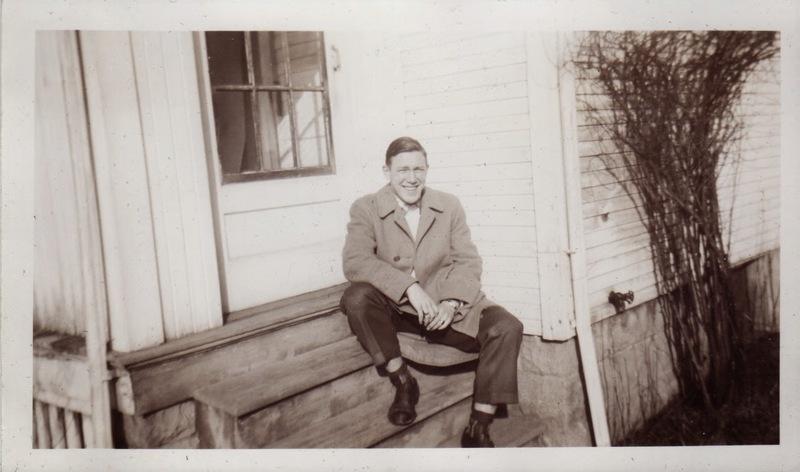 Charles James Lowry (1924-2007), photograph, taken at unknown location in early 1940s; digital image, photocopy of original, scanned in 2013 by Joseph Lowry; privately held by Mary McCaffrey, [address for private use], Canton, Ohio. Young man wearing overcoat sitting on steps. Provenance is Mary Pepperney Lowry to Charles Lowry to Mary McCaffrey.